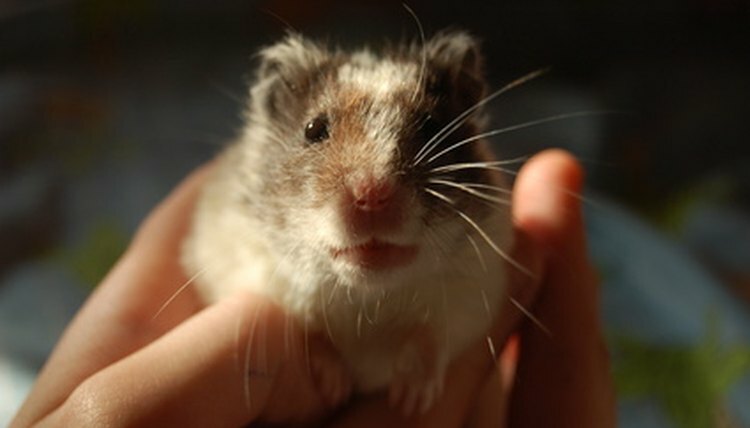 Hamsters can become friendly little pets but this needs some patience, especially if you have adopted an older hamster. Given that you are several hundred times his size, he is liable to view you more as a potential predator than as a best friend initially. Also, children often don’t know how to handle small rodents properly, which means that a rescued hamster might be fearful of people in general because of bad experiences in the past. Place the hamster cage in a warm room but perhaps not the busiest room in your home. It is inadvisable to keep the cage in your bedroom or a room where you need peace to study or work. Hamsters are nocturnal and the sound of chewing, rusting, scrabbling and wheels squeaking all night could become old very quickly. Spend time just standing quietly near the cage each day, if the hamster hides every time somebody approaches. Repeat daily until he is happy to explore when you are nearby. Putting some of his favorite treat in the cage first motivates him to come out. Open the lid and hold a treat, such as a sunflower seed or a small piece of fruit, several inches away from him. If he takes it, excellent; if not, wait a few minutes before dropping it in his food bowl. Repeat daily until he is happy to take food from your fingers. Let him climb onto your hand once he is comfortable with you, using a treat as a bribe if necessary. Repeat over a few days until he becomes very willing to climb on. Scoop up your hamster with both hands, cupping them together. Handle him for a few minutes and then let him back in the cage. Gradually increase the out-of-the-cage time as he becomes accustomed to it.  Hamsters don’t feel secure unless they have a safe place to sleep and rest. Therefore, it is essential that you provide him with at least one nest box, either a cardboard box with a hole cut in the side, which will need to be replaced occasionally as he gnaws it to pieces, or a plastic one from a pet store.  Ensure that other members of the family are as careful with the hamster as you are. Always show children how to handle the hamster properly, and supervise their encounters, at least to start with. ⚠ Don’t offer treats through the bars of the cage. This encourages a hamster to think that anything pushed through the bars is a treat, including fingers. ⚠ Hamsters can catch colds and other infections from humans. If you are feeling under the weather, don’t handle your hamster at all, and wash your hands thoroughly before feeding him or cleaning the cage. Ideally, get somebody else to do this until you have stopped sneezing. ⚠ Don’t provide too many treats, especially sugary ones like fruit. Obesity causes all sorts of health problems. Moreover, dwarf hamsters are prone to diabetes.